Mike: I watched, fascinated as ancient volcanic rock and dirt dotted by an occasional tree passed by my window and the Cessna T206 Turbo Stationaire that was my chariot was now soaring down in the canyon well below the ridges. The sun glistened off the rippling and often white swirling water of the river below us. We bounced around a bit in the bumpy air and suddenly the pilot announced, “We’re on base now.” I’d been looking out the window but saw no airstrip, not even see a patch of open flat ground; nothing but a “V” shaped canyon that seemed to dead-end. The pilot eased off on the power a bit and my seat shifted as he began to lower the flaps. I still couldn’t see a place to land. Flaps down a little more, the airplane slowed and we descended further into the canyon. I was too young and too excited to be nervous or scared. As we rolled into a bank toward the rock wall, its jagged edge dropped behind us as the river made a large sweeping curve as though it were leading our way. Trees swept by our wingtips and instantly there was a small clearing in front of us. Thump! Thump! Thump! We bumped over the rough field, my teeth rattling in my head, as we came to a stop at the end of the clearing. The pilot made the airplane pirouette on its left tire and stopped facing the direction we came. To our right were heavy, green bear-proof boxes. Linda: A friend of ours recently made a trip to Idaho in his Beechcraft Bonanza with a group of people who were learning the techniques of back country flying. A big part of that training is developing good judgment, including which strips are safe for landing in whatever particular airplane one is flying. The State of Idaho Department of Aeronautics and the U.S. Forest Service maintain several back country airstrips for the purpose of getting support personnel into the isolated areas and most are open for recreational use as well. Additionally there are a number of private strips where a pilot can land with prior permission. Idaho is such a great place to learn these skills that Mission Aviation Fellowship, an aerial support ministry does much of their training on these back country strips. MAF was handing out DVDs at Oshkosh this year with lots of video clips of landings in tight places that make pilots go “ooo” and “ahhh”. Mike: I’ve returned many times since that first experience over 35 years ago to learn from those old hands at back country flying – quite useful skills they’ve given me. Linda: Wars and letter writing, that’s what built airports–well that, and the need for places to land those new-fangled flying machines. I finally took Sharon and Bill Tinkler up on their long-standing offer to visit them at their home on Chandelle Airpark in Tullahoma, Tennessee, with a beautifully maintained grass strip next to the large Tullahoma Airport, built in 1942. Like Ellington Field in Houston and others around the country, WWII encouraged the U.S. to build large airports to accommodate military pilot training and serve as an integral part of our defense. Before WWI however, the notion that we could deliver mail by air sprouted many small airports, and the world’s first airline, flown by brave pioneers, cowboys of the sky. I received a substantial but partial history lesson on the beginning of the Air Mail Service from Bill Tinkler, who made a commemorative flight in 1984 of the original east-west route, from New York to California, on the 60th anniversary of the first daily Transcontinental Air Mail service involving both day and night flying. I have more history lessons to attend, after which no doubt you will become familiar with not only an exciting and significant part of our country’s history, but also one fascinatingly fun man. Until then enjoy this smidgen of homage to another great American, one who wrangled the safety of an embryonic industry like a true bronco-buster of the old west, and gave back to us infinitely more possibilities of flight. Mike: The year before the Wright brothers made the first powered flight at Kitty Hawk, Mrs. Lederer, of New York, named her newborn boy Jerome. Jerry, as he was often called, turned out to be a mechanical genius, which New York University recognized by conferring on him a master’s degree in mechanical engineering in 1925, just as the U.S. Post Office was about to begin that daily transcontinental air mail service. Success at his first job, building, calibrating, and operating a wind tunnel, opened the door for his next as aeronautical engineer for the Post Office. The open cockpit bi-wing deHavilland DH-4’s weren’t the most stable airplane to fly, but it’s what they had, and they flew them in every kind of weather, mostly at night. There is only one in flyable condition today. Those daring early pilots were paid handsomely, but one in six who flew the mail at the dawn of aviation perished in aircraft accidents, forging a safety record that had no where to go but up. Jerry Lederer reconstructed the airplanes that crashed to determine the cause of their misfortune, then designed modifications which would help prevent accidents. Among his friends were Charles Lindbergh, whose Spirit of St. Louis he inspected before Lindbergh’s trans-Atlantic flight, and Neil Armstrong, having contributed directly to the safety of both men’s missions. Apollo 8 had 5,600,000 parts and 1.5 million systems, subsystems and assemblies, with which Lederer was intimately familiar. He lived to be 101 years, and for more than seven decades Jerry’s contributions improved safety of flight, from small parts found on simple aircraft today to manned space flight. But Jerry didn’t focus only on the airplanes. He recognized the importance of the human factor and investigated unique and challenging problems facing aviation safety, such as subtle cognitive incapacitation of pilots, cockpit boredom, and interpersonal communications. His warning, “You always have to fight complacency,” can be applied to all of life. Mike: True story: a helicopter pilot who wanted to go fishing with some friends was concerned about the level of the Mississippi River so he borrowed a friend’s Cessna 172 and flew his fishing buddies over the river to check it out. On the way back one of the fishing-buddy-passengers asked if they could fly over his house. That’s not an unusual request. In fact, normally in a “discovery flight,” the first flight one would take prior to beginning flight lessons, instructors often guide the flight over the prospective student’s house. It’s also not unusual for non-pilots to have difficulty orienting to the view from above. So the pilot pointed out to his friend where his house was – and the white pickup truck that was parked nearby. It was then that the passenger realized there were a couple of men taking things out of his house. He called police and a nearby uncle from his cell phone aboard the circling 172. The uncle rushed over and stopped the thieves, who tried to explain away their actions, but then “cried uncle” when he pointed upward and told them they were being watched. The burglars fled the scene, the Cessna followed, enabling the plane load of fishing buddies to witness apprehension of the thieves from 1,000’ up. Linda: Need a gift idea for your favorite pilot? The Southwest Flying Club of Houston is offering a chance for one lucky pilot to win a one hour session in the brand new Boeing 787 Dreamliner simulator at Bush Intercontinental Airport. Raffle tickets are $10 each, or $100 for 11. Proceeds benefit Angel Flight South Central/Grace Flight of America, a 501(c)3 tax exempt organization. Email Pete Perez, President of the Southwest Flying Club and an active Grace Flight pilot volunteer, at peter@polyseed.com. He will email you a ticket number and at their annual benefit dinner September 17 they’ll draw the winning ticket. You don’t have to be present to win. Mike: Ever thought of going into the airline business? Aeropodium and Airline Visions are offering a new aviation workshop October 5 in Washington, D.C. on how to start an airline. The workshop covers airline business plan development and will include Introduction to the Airline Industry, Generic vs. Airline Business Plan, Common Business Plan Mistakes, Non-Disclosure Agreement, Elements of the Airline Business Plan, Implementation Plan, Management and Support Team, Risk Factors, Capitalization Plan, Certification, and Success Strategies. The cost to attend is only $399 but we’re wondering if they’re offering a discount to any present airlines that have previously filed bankruptcy, received government bail-outs, or merged to avoid failure. Linda: If an airline isn’t quite your cup of tea, perhaps you’d like to invest in General Aviation – GA encompasses all aviation that is not airline or military. The GA industry is growing in China. The freedom to fly one’s own airplane has been foreign to that country, as has freedom in general, but now they’re building infrastructure and opening up low-altitude airspace for GA operations. The Chinese government recently allowed the first GA flight through Chinese airspace when Tennessee businessman Wei Chen flew his TBM 700 around the world, making an historic landing at Beijing Capital International Airport. The Aircraft Owners and Pilots Association will be holding a China General Aviation Summit in Beijing later this month, bringing American ideals to a Communist nation. Let’s hope it has far reaching effects. Linda: “In the early days of powered flight, airplanes were made of little more than wood, fabric and primitive, unreliable motors. Pilots flew low, following roads and railroad tracks as directional guides. If lost, the pilot was forced to land and ask for directions, often from the very farmer in whose field they landed,” writes film producer, director Heather Taylor. Heather Taylor, Executive Producer, "Breaking Through the Clouds"
first public showing of her film, “Breaking Through the Clouds: The First Women’s National Air Derby”. It was quite an event, attended by air racers who had just completed the 2,700 mile Air Race Classic. The 2010 race was special for Heather because it ended in Frederick, Maryland, where she received her undergraduate degree from Hood College. Her film was shown at Hood after the finish of this historic race, exactly 20 years from the date she graduated. Since the race is organized two years in advance, the timing and location were perfect and serendipitous. 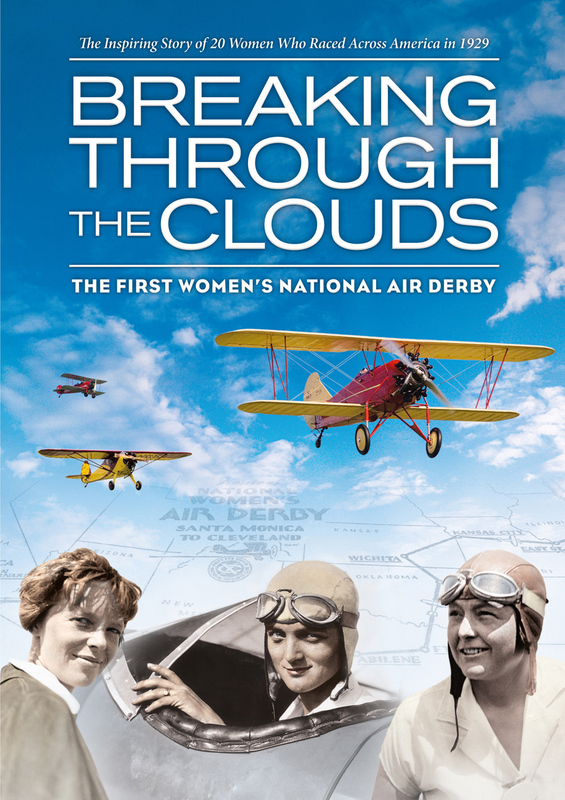 13 years in the making, “Breaking Through the Clouds” is a multiple award-winning documentary of the first all-women’s air race in 1929, the predecessor to the Air Race Classic. Heather grew up in Tennessee in a family of pilots and spent countless hours at local airports. She told me, “I said, ‘God, if You give me a story I know I can make a film.’ Better watch out for what you ask for!” Sure enough, Heather found a story when she interviewed Evelyn Bryan Johnson, aviatrix extraordinaire. Evelyn was “just looking for a break from the dry cleaning business” when she saw an ad for flight lessons. 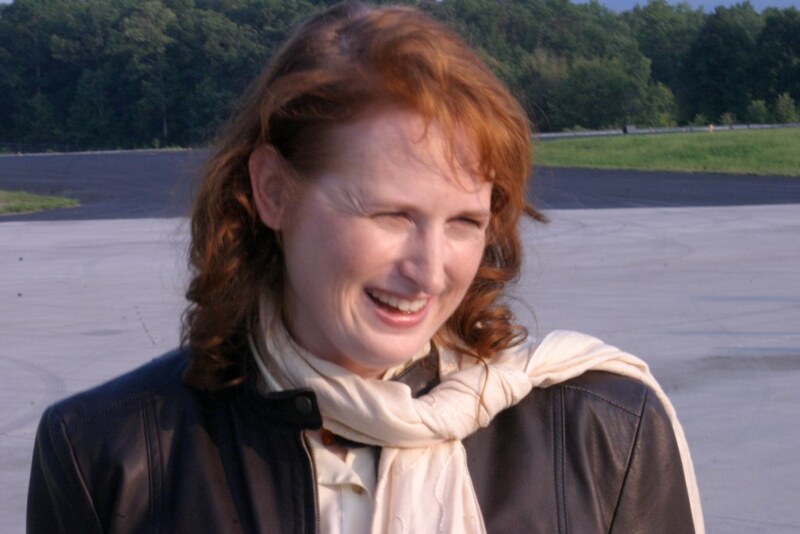 After a long career, Evelyn was inducted into the Women in Aviation Pioneers Hall of Fame, the National Flight Instructors Hall of Fame and the Kentucky and Tennessee Aviation Hall of Fame; she holds the record for the most flight hours of any woman, 57,635.4 hours, and has administered over 9,000 check rides. No wonder she was such an inspiration to Heather! But she mentioned the race, and that’s when Heather knew–the race was her story to tell. 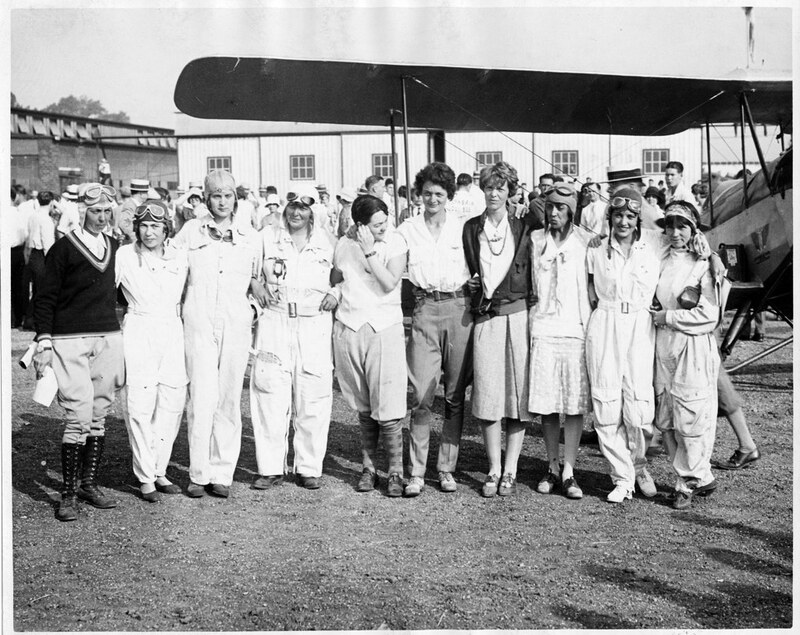 Race pilots of the First Women's National Air Derby, 1929. She worked on it part time for 10 years, then in 2007 decided it’s now or never, left Discovery Communications and went full throttle, forming her own production company, Archetypal Images, LLC. If I listed all Heather’s film credits I’d have no room for anything else. But you would be impressed. Heather aims to “produce films that explore and harnesses that light in the eyes of people who have found their calling in life and share that sparkle with others who are still searching to find their own passion.” The pilots featured in “Breaking Through The Clouds” are role models of this objective. They persevered and have continued to influence others, including me, over 80 years later. Heather hopes her film will encourage each person to “take to the skies” with their own dreams, as did the women of “Breaking Through the Clouds.” Get the DVD at http://www.breakingthroughtheclouds.com/.